In my infinite wisdom I have decided that my half marathon running must be a bit like childbirth – a pain soon forgotten or why would I do it again and again?! And yesterday’s experience was no different. In fact I got a PW (personal worst) and this despite the fact I didn’t go off too fast, didn’t have to resort to walking until much later in the run and even once walking was introduced, there was still so much more running than walking than last year. So how come I was five minutes slower? One thing I am proud of is that I did manage to run up (and down) the dreaded railway bridge after mile 10 – a first! I was very determined and my jaw ached from gritted teeth afterwards. Some very kind people have put it down to the awful weather conditions yesterday but I have to say, it wasn’t nearly as bad as the forecasters and weather apps had predicted. The running weather fairy was kind to us in that part of Kent. Admittedly there was rain before the start but it was only that annoying, can’t make up its mind type of rain. Once the run was underway, the rain appeared to have dried up. Although during the first two miles I couldn’t help but notice the dark skies looming in the direction we would be travelling. After about half way those dark clouds started to offload their wares but nothing outrageous until somewhere between mile 10 and 11 when the heavy rain combined with the strong wind, meant I couldn’t actually see where I was going. Not that they obliterated the view in front of me, just that the rain was blown into my eyes and it was getting a bit difficult to keep those eyes open. Fortunately it didn’t last too long. There were however quite a few strong gusts of wind and a number of occasions when I started to feel like I was going backwards. The run itself is very well organised and despite the loss of on site parking this year, it didn’t seem to cause too many problems. Or perhaps that was just because I got there early and parked easily in the station car park opposite. These alternative arrangements also seemed to work quite well in extracting myself from Paddock Wood post run. I had envisaged being marooned until the run was over and the roads re-opened but that didn’t happen. I managed to exit the area effortlessly and all without harming any of the remaining runners finishing the course. The course starts and finishes in the town but the vast majority of the route is out through open countryside, very rural and very beautiful. Lots of oast houses and farms, together with a sign warning of moor hens crossing. Made me smile before and made me smile yesterday 🙂 The crowd support along the route was amazing considering the weather, I even recognised a few of the marshals from the local running community. The runners themselves are very supportive, on one of my walk interludes a kind lady checked that I was ok – did I look that bad!? The previous day I had been questioning the need for the two sponge stations en route in view of the forecast but I did make use of one of them. Although, forgetting that I was using my running buff in its hair band format, I didn’t get quite the usual sense of overwhelming pleasure as the cold water cooled down my overheated brain. At the end of the run, core strength was sorely tested by having to stand on one leg while a steward tried to detach my timing chip from my shoe – I nearly ended up grabbing hold of the poor man beside me. And I couldn’t help noticing as I walked away from the race area, that all us bedraggled runners looked like we’d just fallen out of the pub after a heavy session on a Saturday night, we were staggering all over the place. It amused me anyhow! So, returning to my opening remarks. During the run, I decided never to do this again (I had the same thought last year), I also decided to give up half marathons and stick to 10ks and whilst mentally acknowledging that I still had a place in the Great North Run, I even contemplated cancelling my hotel reservation. By the time I got home, I had decided against the latter but I did change my recent thoughts about perhaps driving up to Newcastle to “no, definitely catching the train”. By the time I went to bed, there was a little yellow post-it note in my diary to remind me that places for the 27th Brooks Paddock Wood Half Marathon would open in October. This morning, there’s a sneaky little thought of oh well, it wasn’t that bad. Perhaps there’s still some mileage left! Although I have also been busy printing off 10k entry forms for the next six months. A Sense of Impending Doom!? 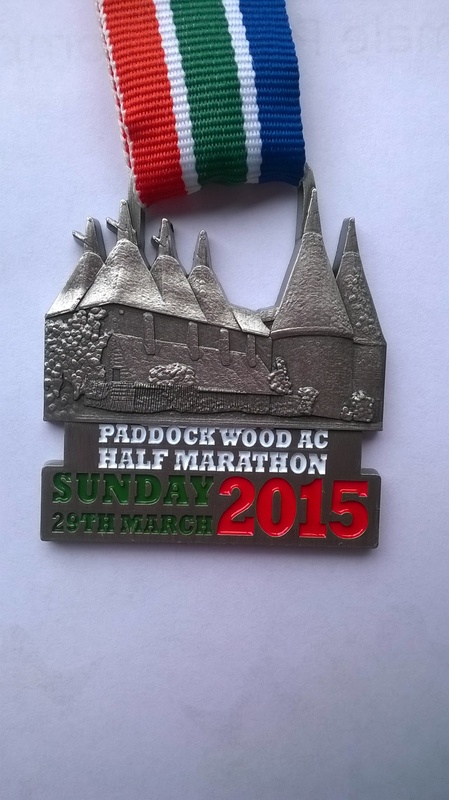 I know one of my 2015 goals is to run a half PB but I don’t think it’s going to happen at Paddock Wood. To be honest I would be happy if I just improved on one of my previous two times (2 hours 7 mins 32 secs in 2012 and 2 hours 8 mins 55 secs last year – getting slower). Time (!) will tell. In the meantime I have to get Sunday out of the way first. *if you don’t know about the Netty/Spen20 debacle, Google it. There’s plenty of comments/articles flying around. It’s nearly a month since KitShack sent me my Alae Buff – Alae is the name of the colour/pattern, of which there are plenty. I have to confess that I’ve often thought a scarf would be quite useful for winter running but I’ve also realised it would probably be a bit impractical and get in the way or, in my case, fall off leaving me running around in circles trying to retrieve it! During the winter months I did notice a parkrun regular turn up with the lower half of her face covered and I had originally thought perhaps she was suffering from a cold and was protecting her chest. Now I suspect she may have had a buff of her own just to keep out the winter chills! 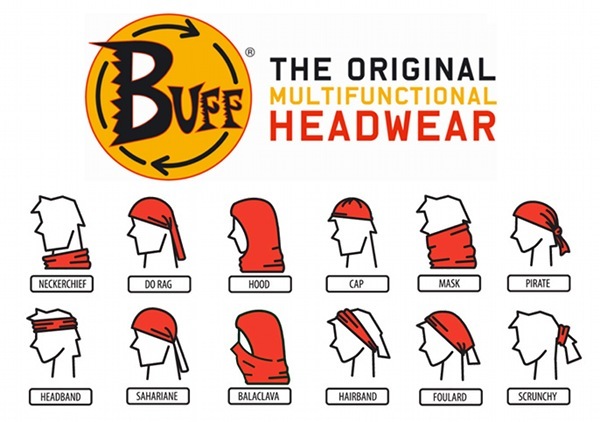 The regular runners amongst you are probably already aware of the existence of buff headwear but it’s all new to me. As is probably typical, the minute I receive my own buff, the weather takes a turn for the better so in all honesty I’ve only needed to use it twice as a mask. The buff definitely kept the elements off my face for the first part of my run and the fabric composition meant I didn’t choke on any stray fibres. But about half way around, I have begun to feel a bit hot and the buff has been transformed into a head band instead. There have, however, been more opportunities to use it as a neckerchief, just to keep that chill out when I first venture off into the cold. It fills in the gap at the top of my running jacket nicely. I’ve also used it in a similar vein when volunteering at junior parkrun when it keeps out the icy wind blowing in off the Thames! When I first received the buff I watched the short You-Tube video demonstration outlining the numerous options available. It can obviously be used for different sports, not just running. Ski-ing springs to mind, and it would probably be ideal for sailing or fishing. Of which I do none – don’t know why I picked on them! And it’s also handy for different weather conditions, not just the cold. In the summer, you can use it as a sahariane to keep the sun off your head and neck – just in case you were considering the Marathon des Sables – I’m not! You can use it as a sweatband on your wrist or, like me, around your head to keep sweat from dripping into your eyes (lovely image, I know!). The only issue I have had with it was when I went out for a run earlier this week. It was a lovely sunny morning so I started off with the buff as a headband to keep the hair out of my eyes. It wasn’t long before I could feel it starting to work its way off my head, I think because it was all bunched up. But that was easily remedied, I just flattened it out a bit and no further problems, it remained in place for the rest of the run. I was sent an “original” buff but there are plenty of other patterns and fabrics available, including the merino wool variety. Initially I did baulk a little at the price, £15, but in retrospect it seems quite good value. I paid £10 for my running gloves and usually fork out a similar amount for a pair of running socks. Gloves are easy to lose when out for a run – well, easy for me – and socks have a tendency to wear out over time so need replacing. I imagine it would be quite difficult for the buff to become detached from your body and the manufacturer claims it will not wear out. Now for the technical stuff! The buff I have is made from 100% polyester microfibre which means it wicks away moisture and its thermal insulation properties make it wind resistant. Apparently its machine washable, dries quickly and the Polygiene content means it’s good for odour control so you don’t need to wash it too frequently – environmentally friendly 🙂 I haven’t felt the need to wash mine yet, the only “smell” is the remnants of any perfume I’ve been wearing before my runs! It doesn’t chafe or irritate because there aren’t any seams and apparently it won’t fray either. Time will tell on that one but so far so good. 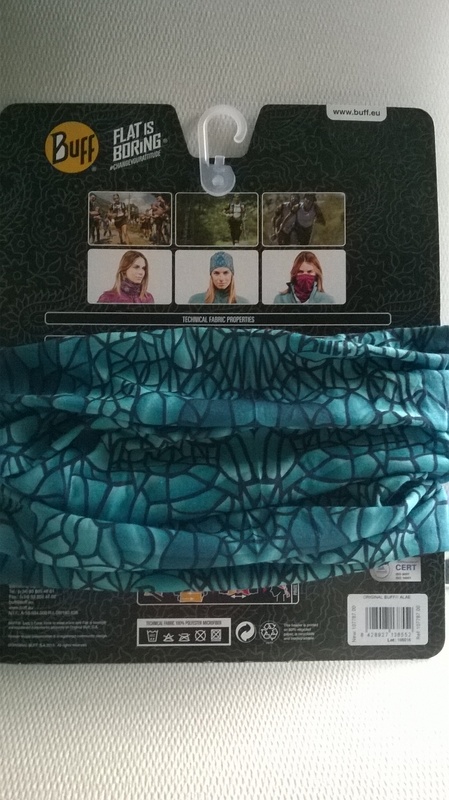 Although we haven’t quite got there in terms of weather and temperature, I have a feeling this buff is going to be a godsend during the height of summer when I have occasionally ended up having to stop mid run because the salty sweat dripping in my eyes means I can’t see where I’m going! The buff is going to help stop all that, I’m sure. I have a feeling it would also be quite useful at any sweat inducing exercise class for similar reasons. Although it’s not necessarily something I would have thought to buy myself (mainly because I didn’t know they existed! ), I think my buff is going to be a brilliant addition to my running wardrobe. I love the fact it can be used all year round and isn’t going to get put in a drawer out of season and then forgotten about. Enough of this shilly-shallying, it’s time to put pen to paper again. Or perhaps more accurately finger tips to keyboard. The Saturday before last I attended my Leadership in Running Fitness course run by England Athletics. 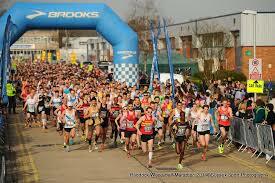 My course was taking place at the Julie Rose Stadium in Ashford which I know very well from the annual Givaudan 10k. 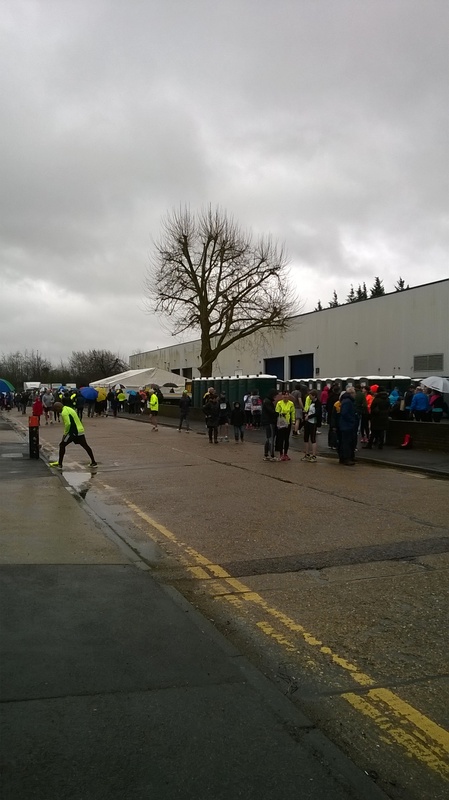 I’ve taken part in this event four times so far and it’s where I achieved my 10k PB so it has good associations – except in 2013 when it rained before, during and after the run – heavily! Click here for my report. Even so, it is my intention to take part again this year. As people began turning up for the 9.00am start it began to feel a bit like a Rebel Runners and So Let’s Go Running convention! They by the way are both local running clubs whose members can often be found at Shorne Woods parkrun, as well as others I’m sure! During the course of the day, it became pretty obvious that I was the only non running club member there and although everybody was very friendly, I began to feel at a bit of a disadvantage. Some of the lingo was alien to me! Although I have now discovered what “drills” are – no, not electric DIY tools! I also began to feel a little bit inadequate! My neighbour was from a running club in Dover and her goal is to run ten marathons before she’s 40. Not only would her tenth be April’s London Marathon, but she’d also qualified for a “good for age” place. No ballot worries for her! And the following day she was planning to run the Thanet 20. If I’d spent a whole day on a training course, I don’t think you’d have found me planning such an epic run the following day! But that just goes to show the difference in attitudes! Mine is surely lacking! Anyway, back to the course. Our session was led by Ana Ockendon and Beth Allott. Let’s just say our Googling during the lunch break was enough to prove both were well qualified to be instructing us! Oh, the power of the internet! There was a fairly even split of lecture/workshop/practical work during the day. During the practical sessions we were split into small groups to practice taking a warm up, training session/drill and cool down. I’m used to working one to one so this was a bit daunting for me but I managed to survive, principally because I very quickly volunteered to do the warm up and followed a model I use with my own clients. It seemed to go okay and passed muster with our tutors. I’d read a couple of blog posts about the course before submitting my application and there had been mention of a helium balloon. This turned out to be an exercise to encourage you to run whilst imagining a helium balloon attached to your head. Try it! I found myself running a lot taller and also a lot more on my toes. I think one of the suggestions is to try this during the latter stages of a run where perhaps your posture is beginning to flag because of tiredness/exhaustion. So I appear to have passed but now comes the most difficult part – completing the DBS application form (Disclosure & Barring Service – formally the CRB check). I find the form so intimidating that I feel like there’s going to be a knock at the door if I don’t fill it in correctly, there are so many do’s and dont’s. Then I have to try to find someone “appropriate” to verify my identity. In view of my procrastination in completing the form and the six to eight weeks it could take to receive the cleared check back, it could be next winter by the time my running club gets off the ground. Wish me luck! My attendance on the course meant another week’s absence from parkrun, but I managed to turn up this Saturday. It’s going to take me forever to join the 100 club at this rate – number 63 so far! 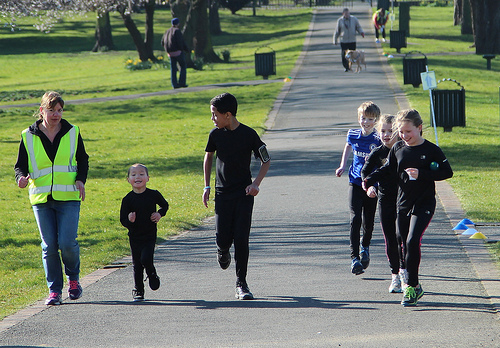 And then on Sunday I was again tail runner at Gravesend junior parkrun. It was a lovely sunny day and in comparison to previous weeks there was definite warmth in the air, despite being on the riverfront, so no thick winter coats were required. Especially when running! I tail ran (is this a new verb?) with a junior parkrun regular and during our 2k tour around Gravesend Riverside I discovered that my companion and I had shared a birthday the previous week. What are the chances of that?! But whilst he turned 5, I turned 54. Just shoot me now! !